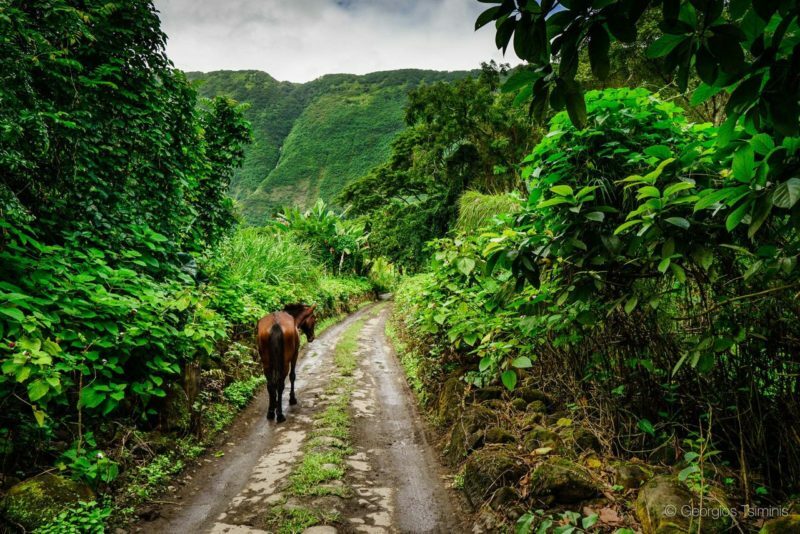 Waipi’o valley was home to old Hawaiian kings and once upon a time was densely populated. 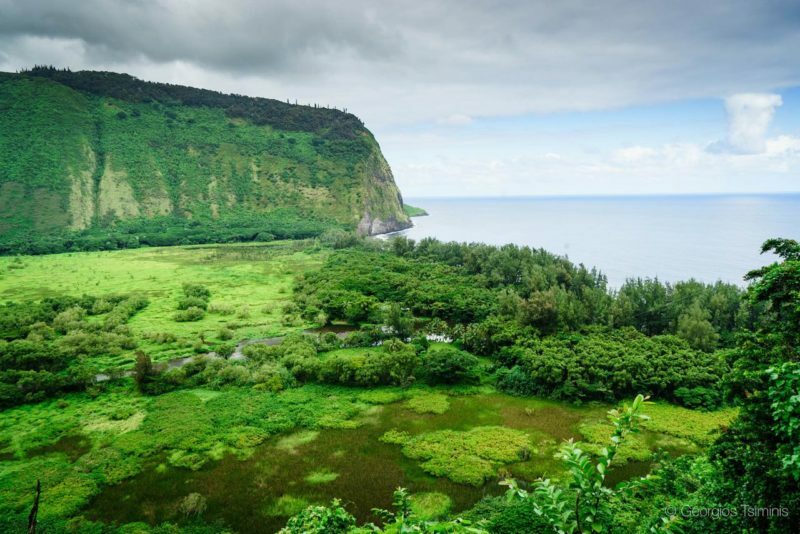 Now however, Waipi’o valley is mostly wilderness interspersed with taro fields (Taro is a traditional Hawaiian staple food) and a couple of dozens of inhabitants. 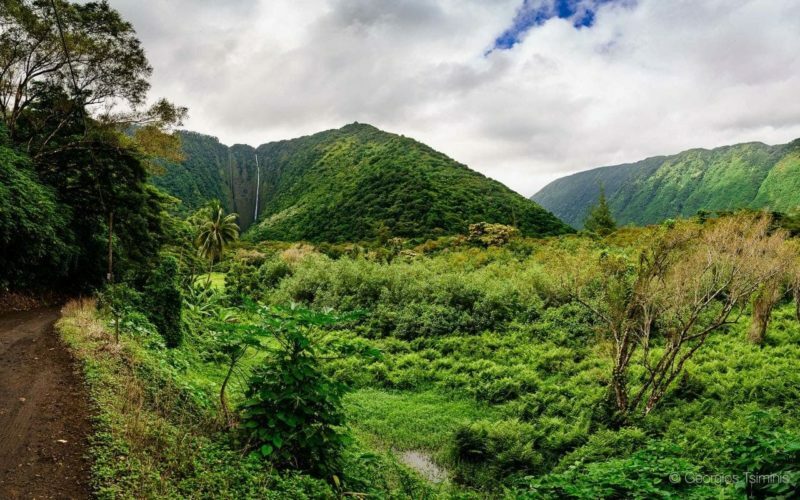 Waipi’o (or Waipio) Valley is named after the river that runs through the valley (wai-piʻo means curved water in the Hawaiian language) and is about one mile wide and six miles deep. Towards the back the valley splits into many ‘fingers’, each one with its own waterfall. The valley meets the ocean towards the north with a beautiful black sand beach that is cut in two by the river. Did you know that the 1995 blockbuster movie “Waterworld” has a very Hawaiian twist? The land discovered at the end of the movie by the survivors (spoiler alert!) was not the summit of mount Everest as shown in this (alternative?) ending, but rather Waipi’o valley. 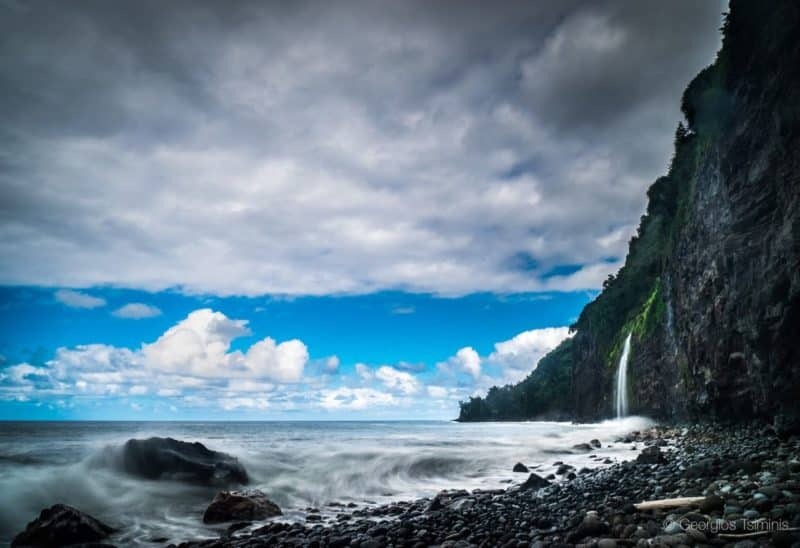 The waterfalls that you can see in the final scenes are the Kaluahine Falls which you can only see on rainy days from the ocean or the valley floor. Overview of Waipi’o Valley from the ‘opposite’ side. You can see the steep Waipi’o Valley access road, the black sand beach, and taro fields. 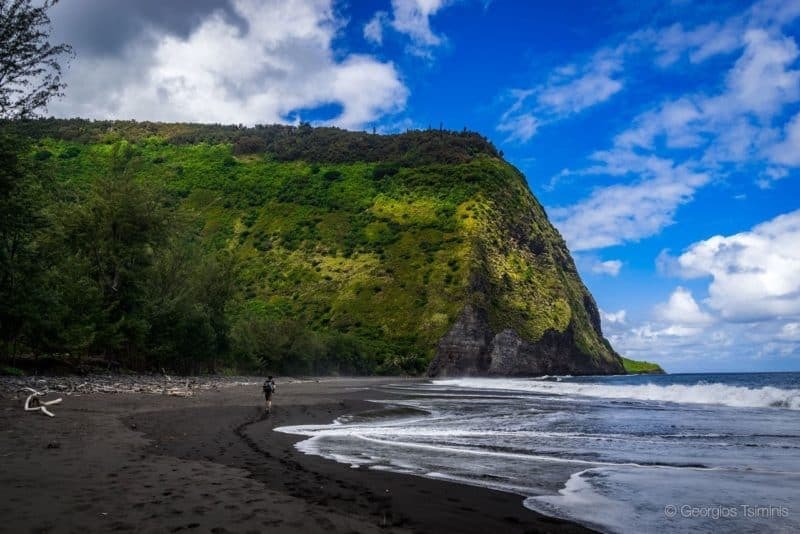 The Hike down into Waipi’o Valley is one of our top-5 short hikes in Hawaii.This hike will take you from the overlook into the valley, to the black sand beach, and back up. The total length of this hike is ~6.5 miles including lots of vertical meters and is not for the faint of heart. The Muliwai Trail zigzags up the opposite side of Waipio valley and ultimately leads to one of the most difficult places to reach by foot on the Big Island: Waimanu Valley. 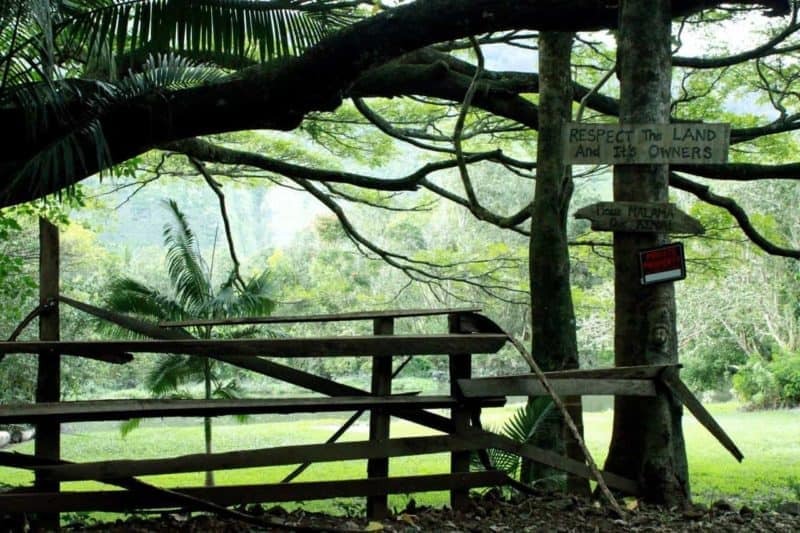 The complete trail to Waimanu valley is an extremely difficult day hike and should only be attempted the most fit and experienced hikers with a penchant for suffering and a self-masochistic streak. The first part of the hike (up the valley wall) is also strenuous but not that long and very rewarding. You will get a unique view in the valley that is especially spectacular with the setting sun. The hike to the Hi’ilawe Falls in the back of the valley is not possible without crossing over private property and should not be attempted without the landowners permission. You can see these waterfalls already from the access road down into the valley but the best view can be gotten from the Muliwai trail described above as hike #2. 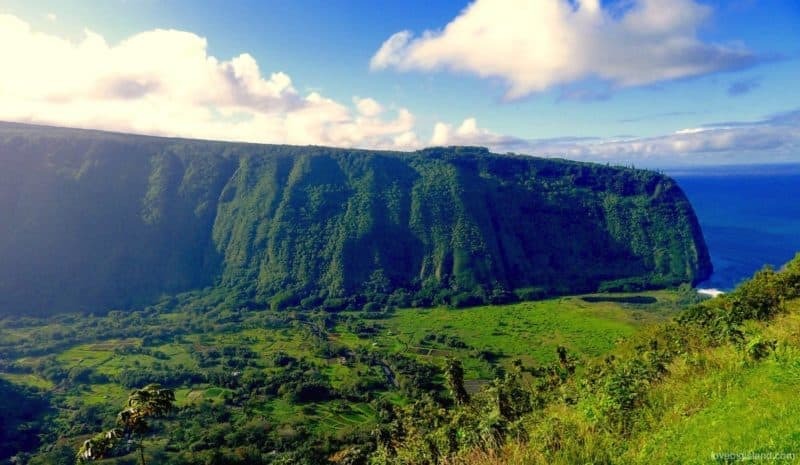 There is a lookout point between the parking area and Waipi’o Valley where you can get a stunning view over most of the valley and the high sea cliffs stretching out to the west. You don’t need to drive or walk down into the valley to get to the overlook which makes it a VERY popular spot to check out the valley. The lookout is great for taking pictures so make sure not to forget to bring a camera. You can also find bathrooms, a picnic area and historic information at the overlook. If you do go down to the valley floor make sure to bring your swimsuit. The black sand beach is a great place for a quick dip. Be aware though that the ocean currents can be strong so do not go into the water too deep. The road down to Waipi’o valley is one of the steepest roads on the island. On the steepest part, it rises 800 ft in only 0.6 miles. The average grade of the road is 25%, but peaks at 40%. Walking or driving down this road will give a good tilt to your horizon :). To get down to the valley floor you must either have your own 4WD car, or be willing to pay for a tour, hike down, or hitchhike down. If you do decide to drive yourself please only do so in a true 4WD car (no AWD) and only if you are comfortable driving on steep and narrow roads with traffic (both ways!). Remember that up hill traffic has the right of way. Some, if not all, car rental companies here on the Big Island explicitly mention in the rental agreement that it is not permitted to drive your rental car down into Waipi’o valley, so be sure to check your rental car agreement to see if you are allowed to take your car down into the valley. Alternatively to driving yourself, you can join a tour that will take you down to the valley floor. There are people living in Waipi’o Valley. You can see the road and some houses and agricultural activity on the valley floor. To get to the beach, turn right as soon as you reach the valley floor. After a few minutes you will reach a black-sand beach. The beach is split in two by the river coming out of the valley, and depending on the amount of water it can be difficult to cross. The beach looks beautiful and is a very good place to relax after coming down into the valley, but take care with going into the water. This beach is known for its rip currents and high surf, making it a dangerous place to go swimming especially during the winter months. If you are very lucky (or unlucky, that depends on how much you mind the rain) you can see the Kaluahine Falls on your right hand (east) side once you get to the beach. These falls only exist when it is raining a LOT. You can read more about this waterfall at the worldofwaterfalls website. Not everyone brings a 4WD car that can drive down to the valley floor or is up to the challenge of walking down themselves. Fortunately there are enough people with this issue to sustain a lively business of Waipi’o Valley tours that take people down to the valley floor. Or one of the many other organized tours down into Waipi’o valley, many of which are e.g. listed on this price comparison website. What is visiting Waipi’o valley like? Several of the images in this guide have been provided by Georgios Tsiminis (Instagram, Flickr). Waipi’o valley was his favorite stop on the Big Island, and Georgios has kindly provided us with his impressions of the trip into the valley to read for whomever is interested in doing the same. As a first-time visitor to the Big Island I didn’t know what to do so I got some local knowledge on where I could go to make memories. Was the best advice I could have gotten! I checked the map, packed my backpack, and off I went early in the morning. The vista that greeted me when I arrived to the valley outlook was breathtaking. Lush green forests covering every hillside and a beckoning black beach made for a timeless landscape. Walking down into the valley is not easy, but listen to the park keeper’s advice and you’ll be rewarded by an amazing tropical landscape. At the bottom of the steep road turn left to explore inlands, where banana and avocado trees line the road leading into the valley. Horses roam free and waterfalls cascade from tall cliffs. Explore and enjoy, and then turn back and walk down to the shore of the ocean. Black sand, trees down to the water and huge waves barreling onto the beach make for an experience that is hard to describe. Walk west along the beach as far as you can, take care when crossing the stream as the water is as strong as it is cold, and reach the end of the beach underneath the cliff for an unforgettable view. Look east across the beach in the distance and notice a waterfall straight from the cliff onto the rocky shore. Walk back along the beach and prepare for a tricky trek along boulders battered by the waves and a constant spray of salty water. You will lose sight of the waterfalls but fear not and persist, for standing next to Kaluahine Falls is an experience somewhere between calm ecstasy and utter relaxation. I had to leave the valley as I was running out of daylight to cross the rocky path and climb up the incredible steep road back onto the lookout. To this day, the memory of Waipi’o Valley fills me with joy and dreams of going back.